As-built Drawings are a very important piece of information that every project must record. As-Built drawings are also called Record Drawings and sometimes referred to as red-line drawings. These drawings demonstrate how the contractor built the project and what changes were made during the construction process. Transferring the revisions and completing the markups on the As-Built drawings must be executed carefully to a final as-built set of drawings. These final set of drawings will contain modifications, field changes; shop drawing changes, design changes, extra works and every change that was approved and made during construction. The AIA has defined and made a clear distinction between the following terms: Record drawings, As-built drawings, and measured drawings. It is recommended to review As-Built drawings regularly for accuracy and completeness by the contractor and the management office representative as part of the monthly payment process. At least one complete set of As-Built drawings must be available on the job site at all times. Never remove old values or details, just line or “X” through them. If there is no room for the new value, you can go to the side on the same line and state the value that is being replaced with. 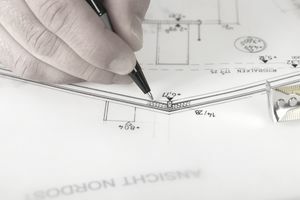 Make sure that supplemental pages containing plan modification sketches have been sealed and signed by the registrant author of those sketches like for example the designer, RE or contractor’s registrant who is providing the sketches. Be sure to add revision notes and corrections to affected section view, general notes, specific notes, profiles, and schedules. Be consistent when adding notes and use the same figure or shape to denote changes or revisions. Add all related shop drawings to As-built drawings as an appendix to the drawings. Make sure there are references on the drawing page to the appendix. Sometimes contracts call for a certain retainage of money until As-built drawings are submitted. Following these recommendations will allow you to have that retainage being paid rapidly. The information provided above is mostly related to the traditional way of recording as-built drawings. However, there are different products and apps that will allow you to keep track of these important changes almost immediately. You can use PlanGrid, ArcGIS, FieldWire and other apps allowing you to add photos and much more information that later on will facilitate the process of completing these drawings. These applications can save money and time as changes can be tracked almost immediately and at the field avoiding errors and mistakes.